Ira Carlin, an advertising and marketing executive with many years of experience including long stints at McCann-Erickson and Universal McCann has been named president, and said the company's launch is a game changer. The launch will be at the South By Southwest (SXSW) on March 10th, 2017 in Austin, Texas. The creation of OZcoinGold, a crypto-currency developed on the 3rd Gen. blockchain, was conceived by CTO Joh Breytenbach when he realized that capital intensive public listed commodity and resource companies experience excessive expenses when raising capital for expansion as well as high regulatory restrictions and high loan costs. Because of the wide acceptance of BitCoin and other crypto-currencies as well as recent leaps in technology in that space, it was decided to tackle those mentioned problems head on with a public listed company as a partner. Company president, Ira Carlin said, "We wanted to create a solution for our partner and give the benefit of a safe exchange medium to the public." Further Ira stated "An advantage to the owner of OZcoinGold is that gold is purchased at the regular Gold price Benchmark, thus ignoring the Bid – Ask variation, which can be significant." The value proposition is that the gold mining company has a proven reserve of 600,000 ounces of gold under the international geocode which is sufficient as a security over any financial instrument. Further "assayed reserves" are estimated at more than 10 million ounces of gold. The mine has given OZcoinGold security over 100,000 ounces of this gold reserve. The OZcoinGold is issued in the ratio of 100 OZcoinGold per one ounce of 24 karat gold. So each ounce of Gold backs one hundred OZcoinGold coins. Gold delivery: OzcoinGold coins may be traded in the open market and exchanges as with every other crypto-currency or held until March 2022 at which time the Coin may be redeemed for 24 karat gold bullion. Each 100 OZcoinGold coins is backed by 1/3 gold bullion stored in the Perth mint and 2/3 gold reserves held by Ozcoin Inc, to be delivered to Perth Mint by March 2022. 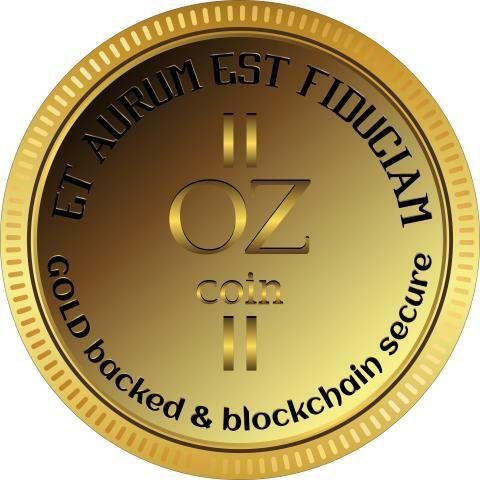 The verification of the gold certificates is uploaded to the block chain in the name of OZcoin Inc.
"Our launch will put pressure on first generation crypto-currencies like BitCoin as they have no real asset backing, and so experience significant volatility in the market", says Ira Carlin. Further, independent auditors will confirm that no more OZcoinGold coins are released than the ounces of gold backing them. As OZcoinGold coins are issued, the auditors will verify that 10 million OZcoinGold coins are backed by 100,000 ounces of 24 karat gold. The two top Crypto-currencies are valued at over $20.3 Billion and have no real asset backing, so OZcoinGold presents an opportunity for people who are crypto-currency fans, gold buffs and people who want to remit funds to their families without paying exorbitant bank and handling fees. OZcoin, Inc. president, Ira Carlin states, "Any time after 1 March 2022 an OZcoinGold owner can "cash-in" their OZcoinGold for 24 karat gold. If OZcoinGold holders choose not to redeem gold, there are no storage or admin fees charged by Perth Mint and they may trade their OzcoinGold coins at will on the open Market at anytime." OZcoinGold is available via www.ozgld.com after the launch on 10 Mach, 2107.